"Calculator Lite" is a simple online calculator designed to work like it is hand-held. How to access to Calculator Lite settings? If you want to perform an operation on negative numbers, you should use the ± button. For instance, if you want to divide −42 by −2, you would simply type 4 2 ± ÷ 2 ± =. If you typed − 4 2 ÷ − 2 =, you would receive an incorrect answer. How do I use the percent (%) button? The percent button can be used to find a percentage of another number. Say you want to add 33 to 26 percent of 33. Then you would type 3 3 + 2 6 %. At this point 8.58 (which is 26 percent of 33) should appear onscreen. To add this to 33, simply press =. Similarly, to divide 89 by 56 percent of 89, for instance, you would type 8 9 ÷ 5 6 % =. If I enter 2×−3= I get −1. Shouldn't I get −6? Just as you would expect from most electronic calculators, only the most recently pressed operator button, −, is used. For example, if you typed in 2 × − ÷ ÷ + 3 = the result would be the same as if you entered 2 + 3 =. An expression in math is like a sentence in English. An expression is just a combination of symbols that have a meaning or value. It can contain numerals, operators and other symbols. For example, 2+2.5 and 2÷9+√4 are both mathematical expressions. An operand is a symbol which is affected by an operator. Two, nine and four in the expression 2+√9÷4 are all operands. An operator is a symbol which effects one or more operands. In the expression, 2+2.5, the addition operator (+) operates on 2 and 2.5 to produce 4.5. I receive a long answer. How do I round it to the nearest whole or decimal place? The purpose of rounding is to make a number easier to work with. The problem is that by rounding you lose some accuracy. To make sure you lose as little accuracy as possible, you should choose the number which is closest to the original (unrounded) one. Take the number 7.1 as an example. To round it to the nearest whole, you'd simply choose 7 because 7 is closer to 7.1 than 8 is. Rounding a 23.5 is tricky, because it's just as close to 23 as it is to 24. There are a few different methods for dealing with this case, though the most commonly used is to round up. In this case, 23.5 rounds up to 24. 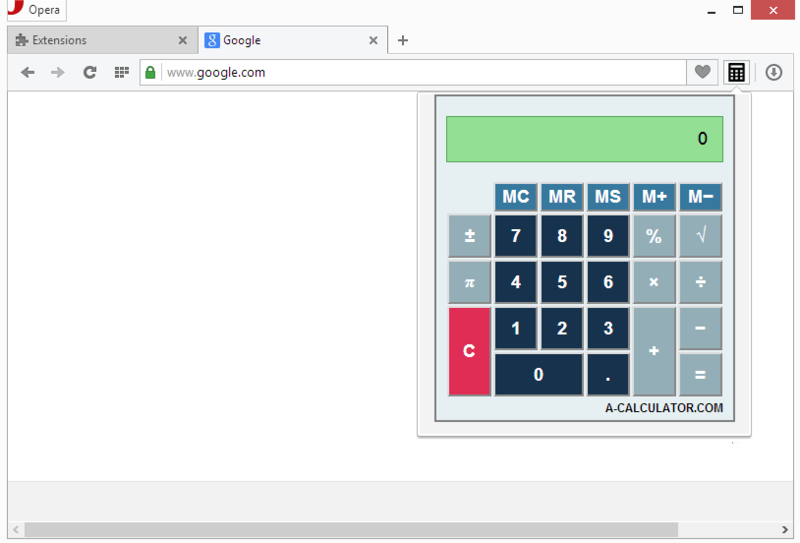 How to install Calculator Lite in your Firefox? To install Calculator Lite, head to Mozilla Store and click on "Add to Firefox" button. How to uninstall Calculator Lite from your Firefox? To uninstall Calculator Lite go to Firefox -> Add-ons -> Extension Name, then press Uninstall button.